Just a mile from Coggeshall, Essex, the Marks Hall Estate Arboretum is a garden of trees, the place to wind down, walk and watch wildlife. The estate contains ornamental lakes, over eight miles of woodland walks and footpaths and a 18th-century walled garden. Over the last three decades the estate has been restored to its former glory by the Thomas Philips Trust, but the walled garden had little attention. When the Trust was formed in 1971 the site of the walled garden had already been cultivated for 300 years. But by the early 1970s it was a mess of scrub and debris, with the only reminders of the original planting being a few old apple trees. Trust volunteers tidied up the garden, grassed It over and planted borders, but many visitors still found it disappointing that there wasn’t anything special at this focal point, compared to the rest of the arboretum where a different tree flowers or fruits every day and the shapes and colours are constantly changing. It took two years to raise the money – from charitable trusts, commercial bodies and visitors – and three years to transform the garden. Marks Hall staff and volunteers carried out the management of the project as well as most of the actual work. They were supported by designer Brita van Schoenaich, of Schoenaich Rees Landscape Architects, who came up with a flexible plan that, within an overall framework, allowed the materials and planting to be adapted according to the money available. Interestingly, in such a historic setting, contemporary, hand crafted Blanc de Bierges materials have been used extensively. She feels that themed gardens have become such a fashion and are often quite ephemeral. 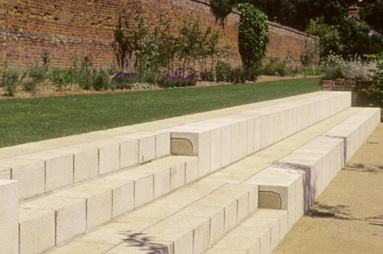 She wanted to create a design that respected the atmosphere of the existing walled garden and did not hide the beauty of the 18th century wall. “The garden has a contemporary look emphasising the change in garden culture from a walled garden which produced fruit and vegetables to a pleasure garden to be enjoyed by the public.” von Schoenaich adds. The idea was to offer a wide range of experiences in terms of the use of space and materials as well as the heights, shapes, colours and seasonality of planting. 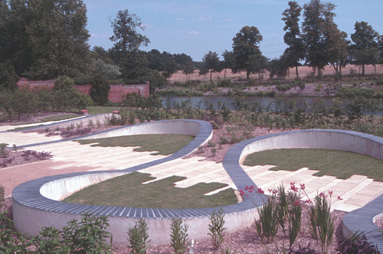 Much of the planting forms linear strips to emphasise structure – as van Schoenaich felt the derelict garden was “crying out for order”. She adds that the Trust had been keen to use local suppliers wherever possible: Blanc de Bierges materials are all handcrafted in Cheshire using UK-sourced materials. Each garden room is different but there are linking themes. The first, with its tilted earth sculpture, is designed to be calm and contemplative. Apart from the grass sculpture, the only planting is a hedge of pittosporum. This appears in one corner and ‘climbs through’ the boundary hornbeam hedge into the second garden. Here the pittosporum hedge meanders in sweeps, providing a frame for the perennial planting and a background for a future seating area. The planting peaks in early summer, the colours being typical of the time of year with pink, primrose, yellow and shades of blue predominating. The meandering hedge continues through the hornbeam enclosure to emerge in the central garden of spheres.. In this garden, planting turns into stone with a series of clipped box spheres linking to stone spheres. These spheres harmonise with the two-tier linear seating created from Blanc de Bierges L-modules and step components. The hot colours of mid-summer dominate the planting. In the fourth garden, a meandering wall topped with Welsh slate echoes the hedge of the second. This wall crosses a Blanc de Bierges path, which is itself a strong point of visual interest. The paving slabs in two different sizes are laid to give the path irregular edges. The planting flourishes through late summer into autumn with dark yet vibrant colours. The final garden is another space of green calm. Here, the massed horn beams will be cut to form a series of undulating green mound. The focal point for the garden is a shallow pool with slate laid on edge to create an impression of deep blue water, even when the area is dry. Since the walled garden was opened by the Duchess of Devonshire, it has proved very popular with visitors to Marks Hall. This is partly, as Jukes explains, because it is very different from other gardens in the area such as The RHS Garden Hyde Hall, Chelmsford, and The Beth Chatto Gardens, Elmstead Market.